The reliable Fleck 5600 and 2510 Twin Demand control valves for back-washable filters and softeners can handle flow rates up to 20 gallons per minute and are made to provide the backwash capacity for softeners up to 12" in diameter and filters up to a 10" diameter. 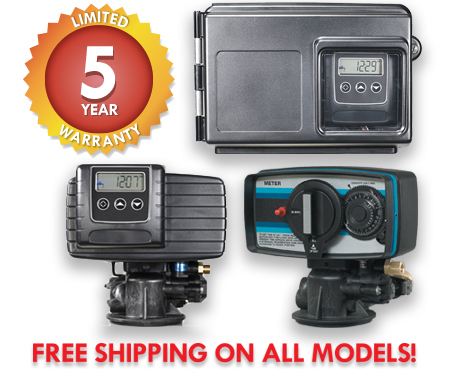 These control valves offer an easy-to-program timer that controls regeneration of the filter or softener, as well as metered valves, which measure the flow of water to determine regeneration cycles. The metered valves come in the standard Econominder style, which uses a mechanical face and is programmed with knobs and buttons, and the SXT uses electronic programming.